You’re probably eating, sleeping and reading everything pregnancy related all day long. So to help you out with your pregnancy information overload diet, here are some must-see pregnancy films to keep you entertained while you wait for the impending birth of your baby. You may have noticed your attention span dwindling as your attention slips back to your pregnancy during most television shows, but hopefully these pregnancy themed flicks will be able to hold your attention. Our disclaimer is that we don’t recommend all the advice and information in all of these movies – most of which are designed for fun and humour! This US comedy, featuring a star-studded cast including Cameron Diaz and Jennifer Lopez, follows the pregnancies of a group of women, all of whom have very different experiences. From bouts of morning sickness on live television, to smooth problem-free pregnancies, adoptions and accidental pregnancies, this film covers so many pregnancy and parenting topics in a light and entertaining way. You will find yourself laughing out-loud throughout, but may also shed the occasional tear during this fantastic movie. Check out What To Expect When You’re Expecting here. If you only choose one movie on our list, make it this one. The Business of Being Born isn’t a romantic comedy or an 80’s movie, but it’s a brilliant film that all pregnant women should watch. This eye-opening documentary produced by Ricki Lake explores modern experiences of childbirth in the US (which is very similar to Australia and other countries). The film looks at natural childbirth, caesareans, inductions, homebirth, epidurals, doulas and everything in-between. The film investigates modern reliance on medicines and interventions during childbirth, and looks at the impact of how birth is treated as a medical emergency rather than a natural occurrence. If you want to be clued up and armed with facts about childbirth, then this is the documentary for you. Get The Business of Being Born on DVD or instant video here. Already seen the first one? Don’t miss part two and part three, which offers even more content. Hugh Grant and Julianne Moore make 90s movie magic in this heartwarming romantic comedy. Grant’s signature hair flop of the 90s takes centre stage, accompanied by the beautiful Moore as a dance teacher who faces an unplanned pregnancy. The couple face difficulties as they each adjust to the idea of the parenthood, but, in true 90s form, there is a happy ending in sight. The film is great and will have you laughing out loud, but it hasn’t aged particularly well – Moore’s half up half down screams 1995, while some of the humour seems a little old fashioned. See the movie here. For those of you who planned your wedding by watching Father Of The Bride on repeat and repeatedly asking yourself, “What would Franck do?” – this is the pregnancy film for you. All of your favourite characters return in this hilarious Steve Martin comedy. This film follows George’s journey as he prepares to become a father for the third time, and gets ready to welcome his first grandchild. This is a heart-warming film that focuses on family, fatherhood and the ups and downs of pregnancy. Get Father of The Bride 2 on DVD or instant video here. If you need something to cheer you up this pregnancy, you can’t go wrong with Tina Fey and Amy Poehler in this laugh out loud comedy. Fey plays a successful business woman who hires Poehler to be the surrogate mother to her baby. Poehler’s character ends up with no place to live, forcing her to move in with Fey where the couple argue about everything and anything to do with the pregnancy. The film follows their journey as they become unlikely friends, supporting each other throughout the pregnancy. The film is exactly what you would expect from a Fey-Poehler movie, so make sure you’ve done your pelvic floor exercises in preparation. Get Baby Mama on DVD or instant video here. A whole one hour and twenty minutes of ovary exploding baby goodness. Babies is a delightful and amusing documentary which follows the journey of four babies from four different countries. 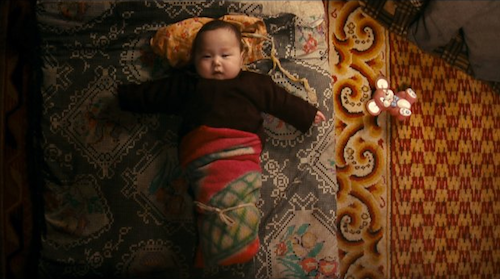 From birth, filmmakers shadowed these adorable babies, and it provided a truly intriguing look into how babies experience life so differently around the world. You’ll especially love the mischievous Mongolian baby! It’s definitely one to watch with your girlfriends — or even with other babies and toddlers around, they’ll be captivated! There is no actual dialogue, just real life — but the photography was a standout (after those adorable babies of course). Check it out here. Drew Barrymore plays a highschool student who falls pregnant unexpectedly in this movie based on the memoirs of Beverly Donofrio. Not your obviously feel-good pregnancy film, this movie features lost dreams, drug problems, and marriage breakdown, but throughout shows the strong bond between Barrymore and her son. This film is funny, emotional, devastating and heart-warming all in one. The little boy in this film will have you desperate for your baby to be born, especially when he delivers his pivotal line, “You look beautiful, Mommy.” Get Riding In Cars With Boys on DVD or instant video here. Not one to watch when your pregnancy hormones are sky rocketing you to cry-ville, this film will undoubtedly have you in floods of tears. This film follows Juno, a highschool student facing an unplanned pregnancy, as she embarks on a search to find the perfect adoptive parents for her unborn child. It also covers the problems faced by pregnant high school students, as Juno doesn’t get asked to the prom, sees people whispering about her, and stands out with her pregnancy bump on canvass. Ellen Page and Michael Cera give killer performances in this enchanting coming of age film, but keep the tissues nearby because you’ll be sobbing by the end of the movie. Get Juno on DVD or instant video here. This Sam Mendes film follows young and eccentric couple, Burt and Veronica, on their pregnancy journey. After discovering that Burt’s parents are moving away, Burt and Veronica decide to travel across the US in search of a new place for their growing family to call home. This comedy-drama is filled with fun and interesting characters, and a few parenting stereotypes, but overall is well worth a watch. Follow Burt and Veronica on their road trip as they try to find the perfect home, will they find one before the baby arrives? Get Away We Go on DVD or instant video here. To qualify for the perfect 80s high school pregnancy movie, who else could play the starring role but Molly Ringwald? This isn’t a John Hughes film, but it still fits in well with the 80s high school genre that has maintained its popularity over the years. Ringwald’s character falls pregnant with her longterm boyfriend in her senior year, and the couple decide to brave it alone and raise the baby by themselves. This film features all the struggles you might expect a teen couple to face, and feels a little like a public service announcement in places. Well worth a watch though, especially if you like a happy ending. Get For Keeps on DVD or instant video here. Jennifer Lopez stars in this romantic comedy that follows a single woman who opts for artificial insemination, and then meets the love of her life on the very same day. After a couple of dates, Lopez’s character realises she is pregnant and expects the new man in her life to run for the hills. But he doesn’t – even when she finds she’s expecting twins. This film contains everything you could possibly want from a romantic comedy, and will leave you feeling all warm and fuzzy inside. Get The Backup Plan on DVD or instant video here. How could you not watch this Arnie classic! Arnold Schwarzenegger plays the role of a doctor who becomes pregnant after his associate, Danny DeVito, convinces him to take an experimental fertility drug, “expectane” as part of a research project. Because the drug fails to gain approval from the FDA in order to continue it’s research, Danny DeVito is kicked out of the research lab. This means that Danny DeVito must keep a pregnant Arnie under wraps, so they can prove that the drug works in humans. The laughs just don’t stop as you follow Arnold’s undercover journey during pregnancy, complete with morning sickness, cravings, soft skin and a monster appetite. See the movie here. Kevin Bacon (Jake) and Elizabeth McGovern (Kristy) feature as young newlyweds in a comedy-romance movie about life and the choices we make as we become grown ups. After getting married, you should have babies, right?! Their parents think so. Jake loves his wife very much but still feels like something is missing. One day, Kristy tells Jake she’s been off the pill for three months — enough to make a man’s life flash before his eyes! She’s Having A Baby also features a young Alec Baldwin. You’ll have a good laugh at the 80s fashion wear too. Check it out here. Last, but not least, who could forget Look Who’s Talking. After Kirstie Alley (Mollie) falls pregnant after an affair with one of her clients, John Travolta (James) finds himself being the taxi driver who races Mollie to the hospital after her water breaks. Being mistaken as the father as he escorts Mollie into the labour ward, James finds himself wanting to be a part of Mollie and baby Mikey’s lives. There are plenty of laughs and romance, as the journey of Mollie, James and wise-cracking Mikey develop. Of course, there is a sequel, so once you’re done with this one, see Look Who’s Talking Too.